Well, the trials and tribulations of Buju Banton have abruptly been ejected from the Jamaican imagination by a raging storm which brazenly breezed its way across the island when no one was looking. 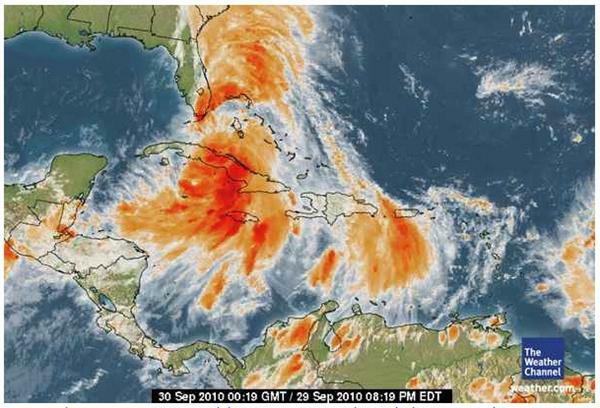 While we were all on Buju watch Tropical Storm Nicole crept up on us in the guise of a tropical depression, dumping gallons of rain accompanied by some of the scariest thunder and lightning i’ve ever heard. As @MsTrendsettas exclaimed: Bruce’s lying has spread! The met office is now lying to us. This is a hurricane, dem cant trick me! Up to 14 lives are believed to have been lost, which should give you some idea of the magnitude of the disaster. Hurricane Gilbert, back in 1988, the worst hurricane to hit us in recent times, only claimed 18 victims in total. So many roads and bridges have collapsed all over the country leaving large numbers of people stranded, it makes the vicissitudes of India’s much maligned Commonwealth Village look like a joke. These roads were clearly never built to last though millions of dollars were allegedly spent constructing them. My heart goes out to the family in Liguanea whose house was washed into the gully while they slept. A gully which swiftly bore them away; only one body has been found. 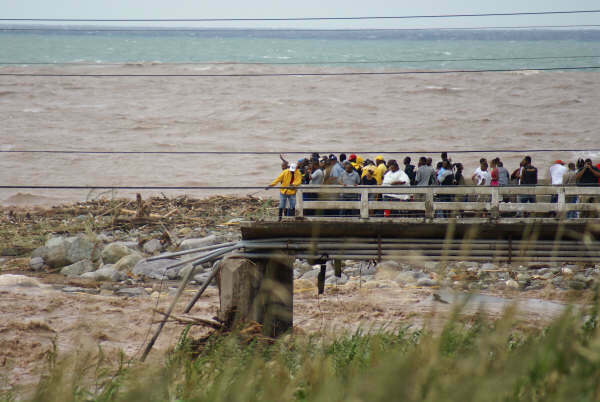 Rescue crews didn’t dare search for them because of the electricity poles that had also fallen into the gully with live wires gushing lethal voltage into the raging water. Two adults and five children, missing, presumed dead. Meanwhile newscasters on radio and TV alike abused the term ‘inclement’ as if there was no other phrase available to describe the weather. Every single school and place of business whose closure was announced blamed the ‘inclement weather’ for doing so. The pompous phrase was bandied about 30 or 40 times leading @HarleeQuinn to tweet: Newscasters; here are some synonyms for “inclement”: foul, harsh, intemperate, rigorous, rough, severe, stormy, tempestuous, violent. Not to mention the simple ‘bad’ or the stark ‘hostile’, either of which would have been adequate. But no, the weather is ‘inclement’. Such a pompous relic of Victorian English, i bet its rarely used in contemporary Britain, but like a fly in amber remains trapped for eternity in its supposedly anticolonial former colonies. There must be one old man who writes descriptions and dispatches it to all the media houses for them to follow. Why is no one asking why is it when a little rain fall, the country pop down? Then those of us who pay our taxes have to repair it. Next Next post: Buju: Voice of Jamaica?